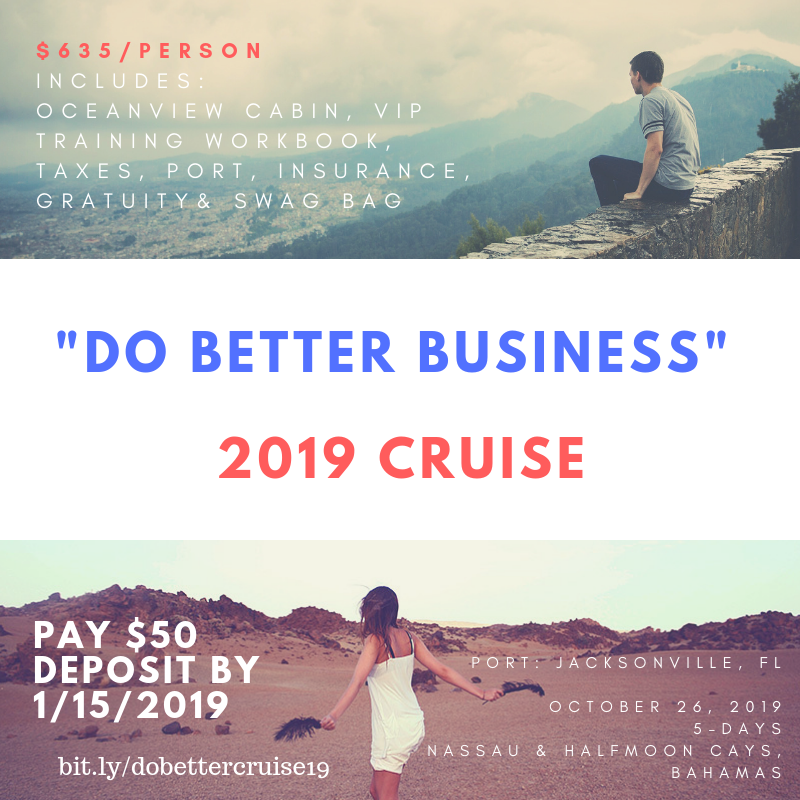 The Do Better Business 2019 Cruise is designed for entrepreneurs to gain the knowledge and tools needed to excel in their business. Our trainers are dedicated to ensure you learn and implement while enjoying the Bahamas! We have some great Power Partners who have come together to construct a mind blowing training workbook which will be used during our Do Better Business Breakout Sessions. Port: Jacksonville, Florida Date: October 26, 2019 Duration: 5-days Land destinations: Nassau and Half Moon Cays, Bahamas The Package includes an oceanview cabin, meals, training materials, SWAG bag, taxes, port, gratuity, and trip insurance. $50/person deposit is due now and the remaining balance of $585/person is due July 15, 2019. *Note by purchasing you will be contacted directly by LaToya Rose Travel to confirm your cabin and payment schedule within 48-hours after receipt of deposits from payhip.com or cash app. You will pay $50 today and your card will automatically be charged $50 until July 15, 2019 in which the remaining balance will be due. You must be paid in full to keep the oceanview cabin. Total price including the oceanview cabin, port and taxes, insurances, gratuity, and training workbook is $635/person. You will pay $117 today and your card will automatically be charged $117 until July 15, 2019 in which the remaining balance will be due. You must be paid in full to keep the oceanview cabin. Total price including the oceanview cabin, port and taxes, insurances, gratuity, and training workbook is $635/person.